Yes, is the answer to the question most likely in your mind right now! It is totally possible to use real, fresh beautiful flowers on a wedding cake, or any cake in fact. Flowers and wedding cakes in particular are a pretty good match if you ask me. However, the flowers don’t need to be created from sugar (as beautiful as they can be), real flowers can add a striking quality to any design and I’m about to share some tips and pointers on how to make sure this works for you. Many people seem to think it’s not possible but if you follow a few guidelines and make sure they’re not poisonous then you, your cake and your customers will be absolutely fine. So long as you do your research and prepare the flowers and the cake correctly you can end up with a really beautiful design. Plus, if you have a customer on a budget I find that buying organic flowers is actually cheaper than making sugar flowers which take a lot of time so can help with reducing costs. 1. Flowers purchased from the supermarket are NOT OK. They have been sprayed with pesticides and all sorts of nasties that will make people ill. Even if they were to not eat the flower (yes, there are some very adventurous foodies out there!) the chemicals can transfer over. 3. 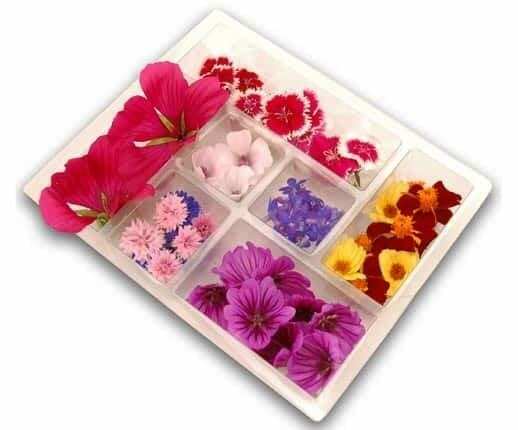 Flowers purchased organically or from a reputable, reliable edible flowers company ARE OK and in fact really easy to find. On the occasions I have used edible flowers then I can highly recommend First Leaf who I’ve used a few times and they never disappoint. Another favourite supplier is Greens of Devon who have a fab flower guide on their site. 4. Please don’t stick the flower stem straight into your cake. My preferred technique is to use a posy-pick and wrap the stem in florist tape or/and cling-film. This ensures nothing falls of the stem and creates a barrier. It is a little time consuming but really should be done. 5. When arranging on your cake start with the largest flowers and then add the smaller ones as a filler creating a nice cascade or a little spray on each tier can look pretty too. 6. And finally, arrange your flowers on the cake at the very last minute and until you do need to use them keep in the fridge or a cool box as they will prevent them wilting as quick. Hope this helps but if you are unsure still please do speak to your supplier or even contact the wedding florist who should be able to help too.